If you’re looking for a cool, creamy snack to serve on a warm day, try this deliciously refreshing cream cheese and cucumber dip. 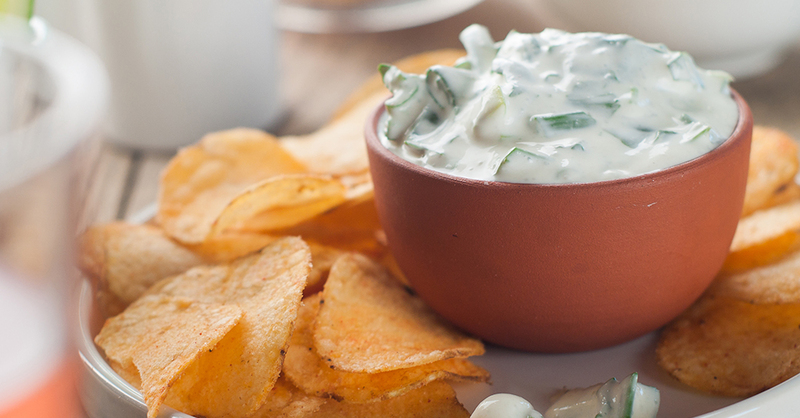 Served chilled, it makes a great alternative to other veggie dips such as tzatziki or hummus. It’s super simple to make – we whip ours up in a few minutes and let it chill in the fridge for a bit before serving. Perfect for a barbecue, picnic or other casual outdoor gathering, this herbaceous dip can also be made the day before your get-together and refrigerated overnight so the flavors have time to blend together. Whether you decide to serve this dip with crackers or veggies is up to you, but either way you can’t go wrong with cream cheese and cucumbers! In a medium mixing bowl, combine cream cheese, sour cream and mayonnaise. Add lemon juice, cucumber, dill, salt, and pepper, and stir thoroughly to combine. Refrigerate until thoroughly chilled, 30-60 minutes. Serve cold with crackers, chips, or chopped veggies, and enjoy!